Markup software application information in the body of a web page to better display your app details in Google search results. We are currently piloting this feature with a restricted set of initial data providers. We hope to soon open up the feature so any provider who implements spec-compliant markup is eligible to participate. We are in the process of implementing JSON-LD support for this rich results type. At the current time, we recommend using microdata or RDFa. itemscope indicates that the HTML enclosed in the <div> is an item, and itemtype="https://schema.org/SoftwareApplication" indicates that the item is a software app. The app includes nested Review and Offer information. The full definition of SoftwareApplication is available at schema.org/SoftwareApplication. 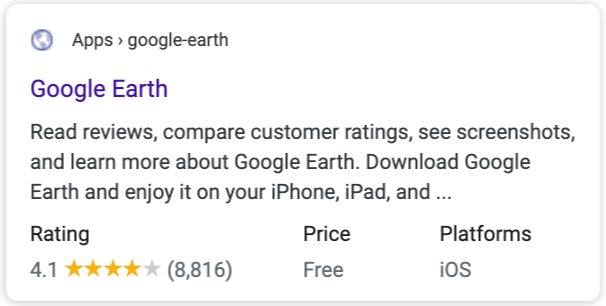 The aggregate rating of the app. The type of software application (for example, BusinessApplication or GameApplication). Must be one of the supported software application types. An offer to sell the app. For developers, Offer can indicate the marketplaces that carry the application.For marketplaces, use to indicate the price of the application for a specific app instance. For mobile applications and web applications, Google also supports MobileApplication and WebApplication .